Fresh classic tasting Watermelon flavor that compliments just about any treats. Satisfy your taste buds with the refreshing taste of watermelon flavor. 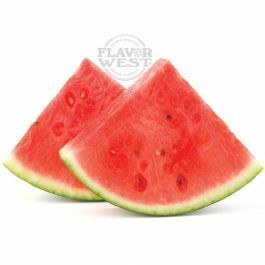 Type: Watermelon Water soluble flavoring. Ingredients: Natural and Artificial Flavoring, and Propylene Glycol. USP Kosher Grade Flavoring. Usage Rate: 15-20% for E-use. Flavor suitability: Desserts, cakes, pastries, smoothies, drinks and more. Specific Gravity: 1.02 No Refunds on Flavoring. I REALLY wanted to love this flavor. Watermelon has always been my "go to" flavor for candy, gum, sorbet, etc. This flavor was really disappointing. Maybe I've mixed it too strong (15%)? I'm not going to kick this to the curb since I hope to find a way to mix this and enjoy it. Unfortunately, I haven't found a way to do so just yet. My advice would be to purchase a small amount and see if you can mix it in a way to your liking. I went for the big bottle and now have to figure out what to do with it. Tastes just like a watermelon Jolly Rancher. Tastes just like a watermelon Jolly Rancher. If you are looking for a fresh ripe watermelon this isn't it.